Are you a lobbyist for the coal industry, looking for the best way to meet members of Congress who will put your dirty energy money ahead of modern environmental standards and their constituents' health? Maybe the chairman of a powerful congressional committee, seeking yet another industry lobbyist to join your staff and help roll back the Clean Air Act, choosing polluters over children's health? Or a giant oil company who wants everyone to forget about that devastating oil spill and need some insiders to pull the strings in the halls of power? If so, then you need to check out Polluterharmony.com - the #1 matchmaking site for polluters, industry lobbyists, and politicians! Now for the rest of us, don't worry, everyone can get in on the action. Just in time for Valentine's Day, we've launched the new "Polluterharmony contest" to help expose the special relationships between politicians in Washington, DC and polluters, their lobbyists and campaign contributions. We launched Polluterharmony last year, featuring a series of videos that highlighted the connections between polluters and politicians - like industry lobbyists writing legislation that would gut the Clean Air Act, oil executives threatening our coasts with offshore oil drilling, and polluters funneling their dirty money to our elected officials. But this new Congress is on a polluter dating binge, so we need your help to expose the most lurid examples of polluter-politico love. Submitting your polluterharmony suggestion is simple: if you use Twitter, just include the hashtag #polluterharmony and tweet anything that shows a special relationship between polluters and politicians. The best match will get a special Polluterharmony surprise! 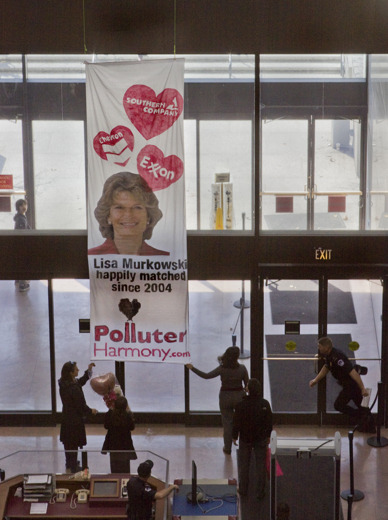 Last year, Greenpeace activists delivered a special Polluterharmony message to a favorite polluter destination – Senator Lisa Murkowski's office. Who will get the next polluterharmony delivery? Send your suggestion on Twitter, and be sure to include #polluterhamony so we see it!